This hypnosis script download is designed for therapists helping clients who are preparing for exams where they need to give a practical demonstration in front of one, or a group of people. They probably already know the theory and feel comfortable with that side of the examination, however, if they believe that they will go to pieces on the day then this hypnosis script can help to gain the confidence that they need to get up there and show them how good they really are. 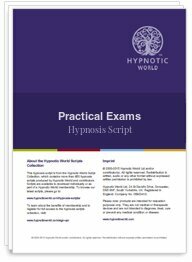 This hypnosis script uses mental rehearsal and powerful hypnotic imagery, coupled with positive suggestions that can help your client to shine when it comes to taking that important practical exam.